There are a few variations on the origin of its name, suggestions include various Gaelic derivations, an Anglic origin ‘Craws Nestie’, referring to the large number of crows that inhabit the area, however the best, but more unlikely possibility is ‘the Cairn of Heroes’, which refers to a battle fought there in 1010 between Malcolm II and the Danish Vikings. The Battle of Barry took place at Lochty Burn in the vicinity of the area which is now occupied by the High Street. The Viking onslaught was led by Camus, who fled to the hills, but was slain and buried by Robert de Keith at Brae Downie. Carnoustie has a street named after him and the Camus Cross is said to record his resting place. Carnoustie is the former home of the linen producing Panmure Works and once a popular tourist seaside resort, benefited from the 19th century fashion for sea bathing. Following the arrival of the railway, it was promoted as the “Brighton of the North” a tagline which they definitely wouldn’t go with in the 21st century for a few obvious reasons. Home to the the famous Carnoustie Golf Links course which first hosted The Open Championship in 1931, and will again play host for the eighth time in 2018. The course has historically proved a magnetic challenge for golfers of all standards, giving the nickname of “Car-nasty” by the Americans, due to its difficulty and the added hurdle of the adverse Scottish weather. 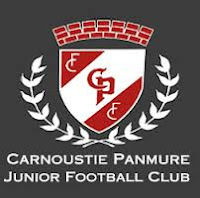 Formed in 1936, Carnoustie Panmure Football Club are nicknamed “The Gowfers” due to the town’s well-established links to golf. Scottish Junior Cup winners 2003-04 and runners-up in 2000-01. League titles include the Dundee Junior League on 7 occasions, five times during the 1950s and twice in the mid-sixties. 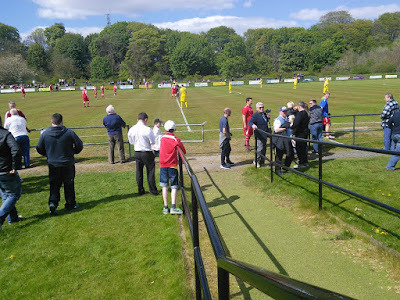 6 Tayport Premier Division titles, including 4 years on the bounce between 1975–76 – 1978–79, 1980–81 and more recently in 2003–04. Also won plenty of honours in other Tayside cup competitions. 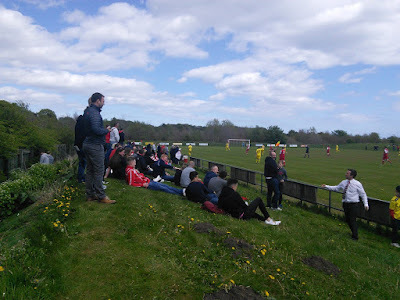 This is the club’s third ground, having started life playing on a park pitch next to the slaughterhouse until 1947, when they moved to Westfield Road. 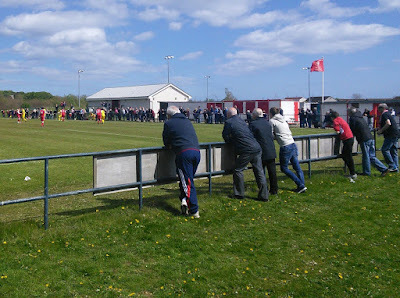 In 2004 they relocated to a brand new facility at Laing Park, which at the car park entrance is signed as Pitskelly Park, the name only used by the local council. 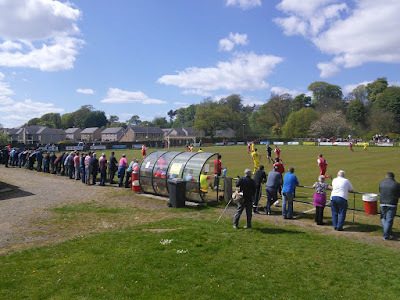 The changing rooms, refreshment bar, club office and dugouts are all down one side at the pay entrance, with the rest of the ground made up of grass banking. Poor clearance from the ‘keeper fell straight to McIntosh who capitalised by firing in from the edge of the box. Deep left wing cross from the left by Donaldson was met by a peach of a header, which rattled in the stantion of the goal. The goalkeeper pulled off a good save to deny McIntosh but Turner was on hand to net the rebound. Ball in from the left met by a superb volley from just outside the box. Right flank corner kick from Gray met with a strong header from 12 yards. Bonnyrigg have one hand on the Superleague, needing only one point from their last two matches to be officially crowned champions. Nearest challengers Kelty Hearts would need Rose to lose both matches and win their remaining four fixtures, plus overturn a 20 goal deficit. Departed Newcastle on 0743 East Coast train, arrived in Edinburgh at 0920. Returned on the 1900, back in the house for 9pm. A huge “thank you” to James Little(Squad #155) who made the longest trip for my book a helluva lot easier by picking me up in Edinburgh at 11.30am and driving the 73 miles up the M90 towards Angus. 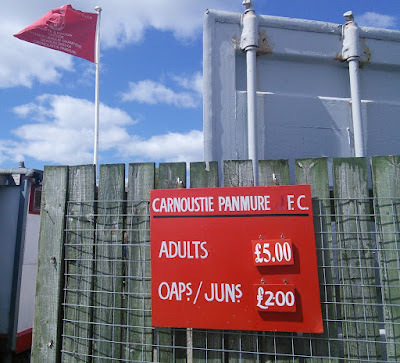 We stopping off for a refreshment break just off the A90 at the Glencarse Hotel and made good time allowing us a visit to the Corner Hotel in Carnoustie before kick off. The return journey went smoothly so I was back in Edinburgh with an hour to spare before catching the train home. I’m delighted to have now ticked off the furthest grounds in my Scottish Juniors quest. I’m now beginning to see some light at the end of the tunnel to finally complete this enjoyable project.